by the national PEN Club of Norway. Armenia's Ambassador as an honorary guest. Ord, financed the project in full. although President Erdogan aggressively denies the Armenian Genocide!" identity crisis after the collapse of the Ottoman Empire". NIOD. The lecture is in Dutch. Netherlands and worldwide will also be presented. across the state, the nation, and around the world. Armenian Genocide," "Armenian Futures: Reconciliation & Remediation,"
and "From the Ashes: Perspectives on Post-Genocide Culture and Art." and for more information, visit the event website. Pope Francis will celebrate a special liturgy in April with Armenian Catholics, who are marking the 100th anniversary of the Armenian Genocide, Catholic News Herald reported. The Vatican confirmed the pope will celebrate April 12 Mass for Armenian-rite faithful in St. Peter's Basilica. Germany refuses to use term "Genocide"
responsibility of Turkey and Armenia. subject to the assessment of academists". commemoration event on 24 April 2015.
participation" was the government's response. massacre, and was partially culpable. illegal in Greece, Switzerland, Slovakia and Spain. 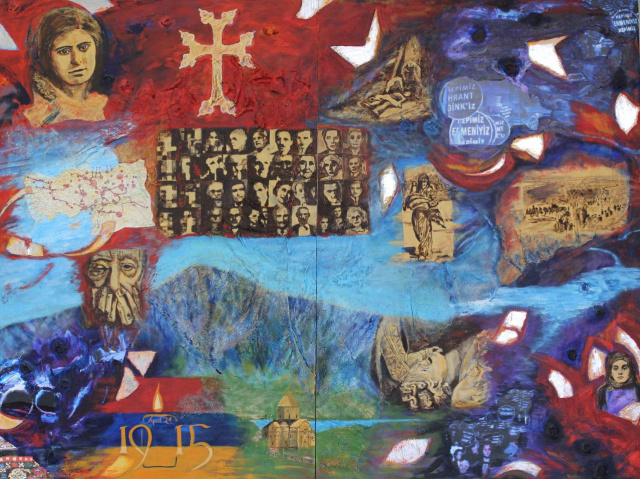 High Park-area artist Arleen McCallum has created a mixed media piece to commemorate the 100th anniversary of the Armenian genocide in Turkey. It also commemorates Armenian journalist and editor Hrant Dink, who was assassinated Jan. 19, 2007. Genocides like the Holocaust and in Rwanda, where an estimated one million Rwandans were killed in 1994, are well-known tragedies in modern history. Perhaps little known is the Armenian Genocide – the first genocide of the 20th century – that saw two million Armenians living in Turkey eliminated from their historic homeland through forced deportations and massacres from 1915 to 1918. High Park-area resident and artist Arleen McCallum hopes to raise awareness of the massacre through a mixed-media piece she has created in commemoration of the 100th anniversary of the Armenian genocide in Turkey. The centennial will be marked through events around the world on April 24. Her work, entitled Hepimiz Ermeniyiz (We are all Armenian), also acknowledges the assassination of Armenien journalist and editor Hrant Dink, who was killed in Istanbul on Jan. 19, 2007. Dink was murdered for continuously maintaining that the Armenian genocide did actually occur, an allegation considered a crime against the state. Inspired to visit Turkey for its architecture, art and culture – particularly its rug-making, McCallum said her travels prompted her to learn more about its history. “Then Hrant Dink was murdered and I found myself focusing my attention – and my work – on the historic plight of the Turkish Armenians and the issue of freedom – freedom of speech and of religion,” she said. McCallum remained glued to the TV to watch hundreds of thousands of Turks, Armenians, Muslims, Jews and Christians march in the streets of Istanbul to mourn Dink and protest his murder. Many carried signs that said, ‘Hepimiz Hrant Dink’iz’ (We are all Hrant Dink) and ‘Hepimiz Ermeniyiz’ (We are all Armenian). Although, she didn’t want to include any of the “horrible” and “barbaric” images of the genocide. The work includes portraits of Armenian survivors and witnesses, the Armenian flag, a reference to Dink’s funeral procession and a map marking the sites of concentration camps and massacres. McCallum hopes to display the artwork publicly in honour of the centennial. Use your pointer to hover over parts of the image to see their respective descriptions. This painting is a commemoration of the Armenian genocide by the Ottoman Empire – present-day Turkey. It also serves as an introduction for those who are unfamiliar with this disastrous event. Though large-scale violence against Armenians dates back to the 1890s, the worst phase began on April 24,1915, so that is regarded as the official start of the genocide. This piece has been completed in order to honour its centenary. The composition includes many emblems of Armenian culture: Mount Ararat, the distinctive Armenian cross, the Armenian Church of the Holy Cross, the Armenian flag, a map of routes used to march Armenians out of Turkey, and the colours of the Armenian flag. Archival photos in the piece depict scenes of a deliberate campaign against the Armenians encompassing deportation, starvation, imprisonment and slaughter. Roughly 1.5 million died in just six years. Fragments of foil stars and moon slivers from the Turkish flag symbolize the mad frenzy during this period. Red, a prominent colour on both the Turkish and Armenian flags, flows like blood and anger. Sorrowful blues and purples emanate from the Armenian flag and the funeral processions of journalist Hrant Dink. He was assassinated in 2007 because he publicly maintained that a genocide had occurred – a belief that to this day, is a crime against the Turkish state. Beneath the surface of the composition, there is a piece of lace which lies flat in some places and falls into folds in others. Its placement and dimension are random. It can allude to many things – domesticity, culture, harmony, comfort, order, memory, prosperity: all things Armenians were forced to abandon. Mount Ararat, dominant and indifferent in the composition, reminds us how the natural world endures. Genocide as reported in the Canadian Press. discrimination, and intolerance, and not to let their repetition in future." and new genocides in future. horrific facts of history in future. recognition, condemnation, and prevention of all known genocides." Sunday in 2015 to the commemoration of the Armenian Genocide. Turkish government still denies the existence of this genocide. to one human being to decide whether life is worth living or not. of its components. Such speech must be fought and firmly rejected. community's own wish and pace. possibilities and limitations of pursuing broader reparations? in St Peter's Basilica on April 12, the Vatican announced Tuesday. year marking the 100th anniversary of the Armenian genocide. complaint from the Turkish government. Armenpress news agency reported Tuesday citing a survey. considered the 1915 bloody event in the Ottoman Empire as genocide. Germany, Russia, the United States and other countries. Genocide on April 24, 2015.
reflex of defensive nationalism by the Turks. this havoc was named Medz Yeghern, or the "Great Calamity." removing Russia as an obstacle all the more important. and a whole army was defeated by cold, frost and bad judgment. fifth-column activities. The rest was a human disaster. generations have been greatly affected by it. say massacres were committed by both sides. suffered the dire consequences of war. of the accepted date of the Armenian Genocide (April 24). of ANZAC forces on the peninsula on the April 25, 1915.
amateurish evasion of empathy with a suffering nation. The President of Uruguay, José Mujica, delivered a speech in a national radio and TV chain on January 27 to commemorate the International Day of Remembrance of the Victims of the Holocaust, which he described as "a real affront to humanity," and used the occasion to remember the Armenian Genocide, Prensa Armenia reported. "We reaffirm our solidarity with the Jewish people. This people composed an important part in the building of our nation. We do it with the same respect and bonhomie that deserves every smaller and larger communities, which form the genesis of our construction," said the president. "We should not forget the genocide, not yet recognized, of the Armenian people. Uruguay maintains that characteristic of respect and solidarity towards all," said Mujica. At the end of his speech he said "only a fierce and strong education and training in tolerance can ensure a peaceful coexistence in this world." Last week, Mujica received a delegation of representatives of the Armenian community and accepted an invitation to join the Committee to Commemorate the Centennial of the Armenian Genocide as a member of honor when he leaves the presidency in March this year. Uruguay, which has a large Armenian community, was the first country to recognize, in 1965, the genocide against the Armenians perpetrated by the Turkish state. French President Francois Hollande on Wednesday called on Turkey to take new steps towards the "truth" behind the mass killings of Armenians a century ago, saying "it is time to break the taboos," according to AFP. "The effort towards the truth must continue and I am convinced that this centenary year will see new gestures, new steps on the road to recognition," Hollande said at a dinner with Armenian groups in Paris. Representatives of a number of Turkish NGOs will come to Armenia on April 24 - the 100th anniversary of the Armenian Genocide, Haykakan Zhamanak writes. According to the newspaper, the Turkish anti-racism group DurDe! (Say Stop to Racism and Nationalism) is among these organizations. nation, and around the world. Coordinating Council of the Armenian Organizations of France (CCAF). unease over statements made just days earlier by Treasurer Joe Hockey. the Armenian people of Ottoman Turkey." position adopted by the Australian government. parliament passed a motion recognising the genocide. position of successive Australian governments on this issue." dialogue between the communities and governments concerned." boat' with Turkey in Anzac centenary year. genocide," ANCA executive director Vache Kahramanian told Neos Kosmos. so-called 'ally' when it comes to discussing the Armenian Genocide." international aid during and after the genocides of 1915-1923." of Armenian Genocide official recognition. remain, terrified of further recognitions by parliaments in Australia.